If you are on a constant quest for low frequencies in your car audio setup, a quality subwoofer is your ticket to audio satisfaction. The best subwoofer for car is much more than just a speaker that you toss in your trunk. Adding bass to your car audio doesn’t mean that you will be drowning out the neighbors as you drive by — the low-end output of subwoofers is all about balance. We collected information on the top subwoofers on the market, reviewing specifications, features, sound, ease of installation, price and more. Here are the ten best car subwoofers for your audio needs. 3 So, Which Subwoofer is the Right for You? At its most basic, a subwoofer is a low-frequency speaker. To get sound to the sub, you’ll need to send it power, unless it comes with an onboard amplifier, such as the Rockford Fosgate P300 and other models included in this review. The P300 comes in a sealed enclosure, for tight and accurate bass sound. The built-in 300-Watt amplifier means all you have to do is connect power and a sound source and you are good to go. With a sleek but not flimsy form factor, the P300 balances powerful performance with ease of installation. This subwoofer’s enclosure is perfect for behind truck seats, or in the trunk of even the smallest cars. The enclosure is sturdily made of ⅝-inch MDF, and covered with industrial heat activated vinyl. Besides being a solidly-built all-in-one bass solution, the P300 also has an array of features to help step up your car audio game. Dial in optimal low-end with its built-in adjustable bass boost EQ. With the included remote bass level control, you can adjust on the go. At around $200, you won’t break the bank with the P300 either. For true plug-and-play functionality, in a fully loaded and powered subwoofer, it’s hard to beat the Rockford Fosgate P300. If you are looking for a simple bass solution, you can be up and running with this subwoofer in no time. This sub also works well as an add-on to an existing system with a built-in subwoofer. Just connect it to your audio system’s subwoofer. A bit hefty for its size. Up until now, we’ve been looking at all-in-one subwoofer units. These excel in convenience, but often are lacking in power. If you want to feel the bass in your bones, and wake up the neighbors a few blocks away, you need a product that is on another level entirely. The Orion HCCA line of speakers are pricey and deceptively simple. One looks just like replacement speaker, but under the hood, there is enough handling power for 5000 watts. The Orion is a product for the car audiophile. You’ll need a separate enclosure, and you’ll need to power it with an appropriately-rated amplifier. You might even need to tweak your electrical system, especially if you plan on running it at full blast more than just every now and then. Once set up and dialed-in, this subwoofer can be your own earthquake machine. Unless you are a car audio savant, don’t try installing this beast on your own, otherwise you risk voltage dropping. But if you are looking to win a car stereo competition, Orion subwoofers can be your ticket. Priced around $500 for one speaker only the Orion HCCA122 is a monster that will take your car audio to un-chartered depths. You have to be pretty serious to dabble with this one, as it may be too much for most people to handle. Wow. The Orion HCCA122 is impressive and a formidable choice for someone who is serious about bass. Great for anyone looking to enter a car audio competition, but for casual listeners and enthusiasts, it may be overkill. Tread lightly and make sure you know what you are getting yourself into, and make sure you get these installed by a skilled professional. Some subwoofer units include speakers and an enclosure but require separate amplification. As you move up the food chain from all-in-one units, you may want to use a separate amp to dial in your ideal sound. In such case, the MTX Audio Terminator is a speaker and sealed box combo that can handle a ton of power. Each speaker is 12 inches, and built out of polypropylene cone. Each speaker also has 1200-watt maximum power and 800 watt peak power. The speakers are protected by a rubber surrounding, have two-inch aluminum voice coils and a 48-ounce magnet. Paired together, you get bass that is about as low as it goes. The enclosure is constructed out of ⅝-inch MDF and aviation grade black carpet. It’ll look great in your trunk but be careful, as it might rattle your trunk into pieces. As a sealed box unit, the sound is deep but not too muddy or “boomy”. As with any speaker-only setup, the amplifier that you pair with the subwoofer is going to be key to your sound. Priced around $150 for two speakers in an enclosure, you get a quality build and deep bass sound for a bargain. Keep in mind that you’ll also have to buy an amplifier and wiring kit, unless you already have these. Another big punch of bass, but more restrained than the Orion, the MTX Terminator is an excellent choice for those who want a traditional box enclosure design for the trunk. Don’t let the seemingly low price mislead you, though, you will have to make considerable additional investments to make sure your audio system is properly balanced. If you are looking for an easier route to low-frequency audio, stick with a slim all-in-one unit. Slim or low-profile subwoofer models are designed to deliver powerful and responsive bass when space is at a premium. Space is one of the main concerns when choosing a subwoofer. The Rockville RW10CA delivers the sonically low frequencies that will keep your music thumping. As a slim subwoofer, the Rockville RW10CA is meant to slip under a car seat, such as the front passenger side. Since it is only 2.7 inches thick, it’ll fit almost anywhere. With a built-in amplifier, you can be assured that your car interior will not be a jumble of cables. Rockville has further streamlined installation so that all you need to do is wire the high-level input to one of your car’s existing speakers. For performance, the RV10CA delivers bass boom, but it’s not going to rattle the neighborhood as you drive along. Priced around $120, the Rockville RW10CA is an inexpensive option for those seeking a compact all-in-one subwoofer. Like the Rockford Fosgate P300, the Rockville RW10CA is an all-in-one solution for adding deep bass sound to your car audio. It is a no-brainer choice for those who are space-counscious, but if you are looking to win a competition against a booming back trunk enclosure, this is not the unit for you. Price is a major benefit here, but you sacrifice sound quality and power in the tradeoff. For those looking for a more rugged enclosed subwoofer, the JBL GT-BassPro 12 provides all of the bells and whistles of an all-in-one subwoofer with a heavy-duty design. This is not a sleek speaker or one that hides its raw power. With an exposed speaker and industrial-chic over-sized speaker protection bars, this JBL screams to be displayed in your ride. The bars are distinctly cool-looking but are quite functional as well. You’ll be happy they are there to protect your subwoofer when you load your trunk with luggage and other items that could damage other subwoofers. The JBL GT-BassPro12 features a built-in 150-watt amplifier, 12-inch polypropylene cone speaker, and a proprietary Slipstream port that eliminates noise at high output. The open design and vented pole piece mean that the powered speaker’s motor stays cool, which improves performance and reduces distortion even at the highest levels. Installation is easy, and the unit includes signal-sensing for automatic operation when it senses and audio signal. Priced around $200, the JBL GT-BassPro12 is a good option for those seeking an all-in-one speaker that pushes the low-end while providing rugged sharp looks. JBL’s products are top notch, and the JBL GT-BassPro12 is no exception. If you want an all-in-one subwoofer that combines ease of installation with stellar performance and rugged features, JBL has the perfect solution for your car. It’s not the cheapest option on the market but is reasonably priced for its features and performance. Much like the Rockville — best value-priced model on this list — the Kenwood KSC-SW11 is intended for consumers who want to add a little punch of bass without having a car audio system that takes over all of their interior space and storage. If you have limited space, but want an all-in-one subwoofer with easy controls and installation, take the Kenwood for a spin. Although it adds some bass, do not expect this model to shatter windows or rumble enough to soak your bones with low frequencies. The built-in amplifier is only rated at 75 Watts, so you already know the Kenwood is not a powerhouse. The Kenwood shines, however, as a sleek addition to an existing audio system. Its aluminum casing looks great, even if you are just going to toss it under the seat out of sight. Like most all-in-one units, installation is easy. Kenwood also provides a remote, so adjustments can be made on the fly. Priced around $130, the Kenwood KSC-SW11 is a suitable entry-level option for those who want sound without bulk or gaudy visuals in their cars. It’ll add low-end, but you will not be floored by the bass sound. Kenwood is clearly marketing this product to those who want a quick and simple way to accentuate their existing audio system. Certainly not for an audiophile, the Kenwood KSC-SW11 will round out your music and give it more depth, but those with stock premium audio might not notice much of a difference from their existing sub. One concern with powered subwoofers is how they draw from your car’s electrical system. Some can be run right to your battery, while others click into to any of your car’s various power supplies. Sometimes, either choice means that you might have a device pulling power, and potentially draining your battery or affecting the performance of other systems. Nicknamed the “Punch Single 8,” this is a full enclosed small form factor subwoofer. It has a 150-Watt Class D amplifier and an 8-inch shallow woofer. As an all-inclusive subwoofer system, all you have to do is hook up to a power source, ground the unit and tap into an audio signal and you will add some bass depth to your sound. While user reviews are generally positive for the Rockford Fosgate PS-8, some have reservations about to cost versus performance ratio. It’s well-built and a good choice for those looking to save space, but the small speaker reduces the bass effect considerably. Priced around $190, the Rockford-Fosgate PS-8 is a suitable entry-level option for those who want sound without bulk or gaudy visuals in their cars. It’ll add low-end, but you will not be floored by the bass sound. Another solid small all-in-one subwoofer, the Rockford Fosgate PS-8 will add warmth to your tone, but you won’t be rattling any windows. Since it is only two inches tall, it fits nicely under most front driver or passenger seats. Say you want a solid subwoofer in an carpeted enclosure that you can match to an amplifier, but you don’t have the room for a three-foot box in your trunk. A truck style enclosure is just what you’d need. Kicker makes well-regarded products, and its line of best subwoofer for car are top notch. The 10TC104 lets you add 10-inch subwoofer power to your truck. A truck-style enclosure is not as sleek and portable as a slim all-in-one that could nestle under your passenger seat, but it is designed to fill a typical truck cab with bass resonance. The Kicker is rated for up to 300 Watts, so make sure you pair it with amplifiers in the 50-300-Watt range. It has a slanted enclosure, about eight inches deep at the base and 3 ½ deep at the top. It is constructed out of ¾ inch MDF and is wrapped in carpet. 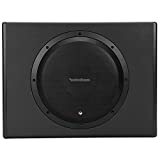 Priced around $100 for one 10-inch speakers in an truck style enclosure, this unit is good for those who have tight space restrictions but who want to use their own amplifier. The Kicker is loud and brings the bass to smaller spaces. Its heavy-duty construction ensure that it is long-lasting, as long as you pair it with the right amplifier. Users discuss how they easily blow out the speaker with a 600-Watt amplifier, which is understandable as that is too much power for this unit. Best of all, this unit is fairly easy to install if you have a little bit of car audio know-how. If you have an enclosure, but just want to swap in some low-end performance, a single voice subwoofer such as the Polk Audio db1040 may be a good choice. This replacement-style speaker is simple but built to withstand the harshest conditions. Ideal for marine applications, but also works well if you are concerned about moisture. This 10-inch black dynamic balance polymer composite cone speaker can handle up to 270 Wats continuously, but is rated 540 Watts peak performance. With this Polk speaker, you can expect deep, precise, gut-shaking bass. Polk Audio manufactures some of the best audio components on the market, and the db1040 is no exception. User reviews liken the sound to a club-like experience. The sound booms, but you don’t lose the clarity and crispness of other tones. Match it with a sealed box and you’ll get distortion-free high-quality bass. Priced around $60 for one 10-inch speakers. You’ll likely want to get a pair of these, and a sealed enclosure. You will also need a separate amplifier and wiring in order to get your sound bouncing. For those looking to upgrade their existing subwoofer enclosure’s speakers, or for those who are looking to build a new setup from ground zero, you can’t do much better than Polk Audio’s products. The marine rating on the db1040 means that your boat can have booming bass now, too, or if you need a waterproof solution for when you want to keep the top down on your jeep, the durability won’t disappoint. Better options available at higher price points. If you’ve made the plunge to high-end car audio, you may wonder where you can find the apex of bass sound. JL Audio’s single 12-inch subwoofer may be the pinnacle of boom. You may look at it and remark, “it’s just a speaker,” but this deceptively simple-looking item is the key to low-frequency. Entrance to this hallowed hall of booming sound is not cheap, and you better make sure you have the right setup to take advantage of all the drippy, pulsing beat that this beast can push. Let’s get the scary part out of the way first. The JL Audio 12W7AE-3 costs $800. That’s just for one speaker. Does it provide $800 worth of performance? Here are the specs: It has a peak power rating of 2,000 Watts, but optimal range is between 400- and 1,000-Watts RMS. It has a solid cast-alloy basket, so it is one heavy speaker at 25 pounds. This heft lends to its sound and ability to handle the most thunderous bass imaginable. This speaker is considered to be the best subwoofer for car on the market. If it weren’t for its prohibitive price, we’d crown it a must buy. For the serious car audio freak, it is a sight and sound to behold. This speaker rocks. It is insanely durable, too. Users report abusing these things for years, without any sound degradation. The JL 12W7AE makes a good case for quality over quantity. Many reviews of other speakers talk about how many years (or months) it took before the speakers had to be replaced. With the JL, you pay a lot up front, but likely won’t ever need to buy a replacement. Subwoofers provide the bass component to your car audio system. Sure, your stock speakers all carry a bass sound, and you can dial in more or less bass from your equalizer, but bass that moves and shakes can only come from a subwoofer. Many typical stock car audio systems provide a small subwoofer, often installed under the rear window area in most sedan or coupes and in the back ceiling of SUVs. These speakers drive low-frequencies, providing not so much sound but a feeling. For those looking to ramp up their car audio, an aftermarket subwoofer can be added in a few different ways. First is simply swapping out stock subwoofer speakers for another brand. But, speakers don’t work on their own. If your system is low-powered, you may need to revisit your entire system to ensure that you have a properly rated amplifier. These speakers can range in price from $30 to a few hundred dollars each. Another option is to get an all-in-one subwoofer unit. These units take out a lot of the guesswork, providing power through a built-in amplifier. These come in all shapes and sizes, but the most popular ones are sleek and easy to store in your car. Several models are meant to be installed under a car seat, for example, while others are a bit bulkier and need to be placed in a trunk area. These all-in-one units are great as gateway subwoofers for those who want to add some bass without becoming a neighborhood nuisance. All-in-one units are easy to install, and typically do not cause issues with your existing power supplies. You are unlikely to win a car stereo sound-off contest with these products, but for personal listening enjoyment, convenience and price, these options are hard to beat. Prices for all-in-one systems range from $100 to $300. If you want to add serious meat to your sound, you’re going to need to look for a more powerful system. This will require investing in a powerful amp and appropriately-rated subwoofer system. If you are ratcheting up the bass, it’s best to ditch your factory enclosure for a sealed or vented enclosure box. Many opt for a dual-speaker subwoofer system as it provides twice as much thunder. There are many speaker choices, from inexpensive simple subs to ones that can cost close to a $2,000 for just the subwoofer speakers. Within the professional-grade subwoofer space, there are many additional choices depending on your vehicle type and need. Some enclosures are large, intended as units for trunks. Others are smaller, designed to go behind seats in two seaters and trucks. Enclosures can be built out of different materials, but most are made out of think MDF and are coated in automobile-grade carpeting. Some have metal or rubber reinforcement to protect against damage in trunks or other spaces. If you are opting for premium audio, and want to pair a receiver with an amplifier and high-powered speaker system, it’s a good idea to invest in quality installation. The power requirements of some amplifiers and subwoofers can tax a car’s battery and alternator. Some setups require additional batteries, too. Make sure you know the total expenditure needed to attain your optimal sound. Once those estimates are tallied up, it may make more sense to look at the all-in-one systems. So, Which Subwoofer is the Right for You? Subwoofers provide a sound dimension that is often omitted in everyday life. We spend a lot of time in our cars, and for many their ride to or from work is their time to soak up their favorite tunes. If you want true bass presence — and once you experience this effect, all other car audio systems will sound thin — you luckily have several options. If cost and convenience are important, opt for an all-in-one unit such as the Rockford Fosgate P300. It is sturdy, has a sealed-enclosure construction and won’t cost you an arm and a leg. This all-in-one unit hits all of the marks for a good bass sound, and you can likely hook it up yourself. For the more adventurous who may be looking for something much more powerful, MTX’s Terminator is a steal for $150. Pair it with a 300-Watt amplifier and you’ll have a booming back trunk that’ll be the envy of other audiophiles. Just watch out for scornful looks from your neighbors — not everyone is all about that bass. That’s it! I hope this guide helped you choose the best subwoofer for car. If you need something smaller , read our guide on the best shallow mount subwoofers. Let me know if you have any comments , i’ll be happy to answer. Which subwoofer would you recommend for a Ford Focus SE Hatchback 2015? I want one that has deep bass but also isn’t too big to fit in the back of the car. Hey Wade, that Focus is a great little car and although the trunk area isn’t huge, it’s going to hold something like this Kenwood Excelon 12″ shallow mount subwoofer really well in a nice compact enclosure. The total room will be reasonable and allow you still carry a bunch of stuff back there. If you really want deep bass, 12″ is the way to go, especially at this price point. I have a MTX 8500 12″ sub on 2003 mazda protege pushing it with a 800watt powerbass amp, is this a good option or is there something else better the way I made an enclosure for the trunk that way it could barely leave me a bit of space!